Based in Cornwall, Jo Downs is one of the world’s most well-known fused glass designers. She specializes in handmade, original coastal-themed wall panels and art frames. Her unique designs have earned her corporate commissions from churches to cruise liners to hotels – as well as private commissions. Opened in 2014, the Jo Downs Handmade Glass in Ripley is home to her only major gallery outside of Cornwall. 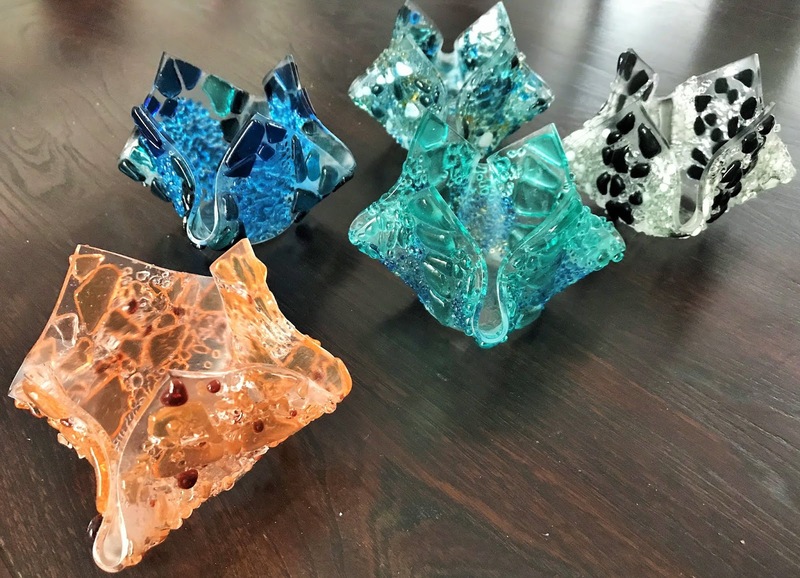 In addition to fused glass drop-in workshops using brass, copper and tin, they offer frit (broken glass) workshops. After a short demonstration, you will have time to design your piece. Using literally every color under the sun, draw inspiration from a beautiful array of gift and interior pieces around you or create something completely your own. We each made a small ‘vase’ (perfectly sized tealight holder) for £25. It was remarkably easy and we were all pleased with the end result. Coasters, larger vases and square framed pieces are also available to make. Fusing with Frit workshops are now conveniently offered on Sundays twice a month. Even if you decide you are not up to making something – there are countless number of custom coastal-inspired gifts available for purchase too!